Over the course of two weeks this summer, nearly 60 young leaders participated in the KGVI Youth Leadership Training at Carronvale House. 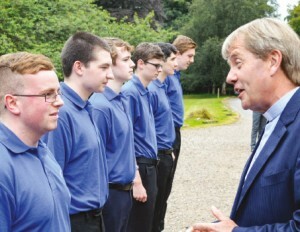 Visiting the cadets during their second year course was Right Rev Dr Russell Barr, Moderator of the General Assembly. Dr Barr spoke with each the young people and paid tribute to the BB, saying that if it were not for BB, he would not be in the position he is today! Congratulations go to all involved in this year’s courses, particularly the 33 who completed their second year. They will ‘graduate’ officially at a service in the Spring next year.